When I woke up this morning I had no intention of doing anything in the kitchen today. I had intended to spend the day cleaning. That plan was shot as soon as I saw that it was National Dessert Day on Twitter. I just couldn't let that slide by without celebrating so the wheels started turning. I had a bottle of heavy cream left over from dinner earlier this week so the search was narrowed to pudding. Toss in the fact that it was also Chocolate Week and the decision was made. It had to be a rich, decadent chocolate pudding. In a separate bowl, whisk together the egg yolks and heavy cream. Set aside. In a heavy bottomed sauce pan combine the cocoa powder, sugar, cornstarch, and salt. Whisk in the milk until smooth. Heat over medium heat until the mixture thickens and starts to bubble. It's very important at this stage to stir constantly, without it the mixture is likely to stick to the bottom of the pan and start to burn (trust me on this one). Take it immediately off the heat and temper the egg/cream mixture by slowly whisking in the chocolate mixture from the pan. When the two are combined bring the pan back up to medium-high heat and continue to cook, stirring continuously until it comes back up to a boil. Remove from the heat. Strain the pudding through a mesh sieve to remove any lumps caused by the cocoa and corn starch. Immediately mix in the chocolate chips. The heat from the pudding should melt the chocolate, but if it doesn't just put it back onto the heat for a minute or so. Or, if you're like me and you like some texture, leave the non-melted pieces as is. Stir in the vanilla. Take the finished pudding and separate it out into small ramekins. Take plastic wrap and put it directly onto the pudding to prevent skin from forming. Chill for at least one hour. Enjoy! Now the question is what to do with those left over egg whites. I know you can freeze them, but honestly my freezer is where food goes to die so I knew if I didn't do something immediately there would be little point in saving them. After some googling I founds this recipe for an Angel Food Snack Cake from Cookie Baker Lynn that uses exactly six egg whites. I made two minor adaptations; I didn't use almond extract as I did not have any on hand (I used an extra 1/8 tsp. 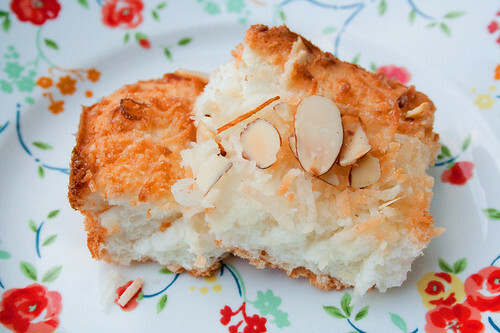 of vanilla extract) and I sprinkled the top with sliced almonds prior to baking to add some extra flavor and crunch. The cake is delicious and simple, definitely something I'll be coming back to when I have just a few egg whites sitting around. Did you do anything for National Dessert Day? I did not know it was dessert day, so I've missed it. Though, at least, I had a mousse au chocolate for dessert when I had lunch yesterday. Your doule chocolate pudding looks so delicious, wish I would have had this one. National Dessert Day - my kind of holiday! I'm glad the snack cake turned out so well for you. The almonds on top look like the perfect addition. And that pudding? Wowza. It's going on my to-make list! @Lemon That sounds delicious too! 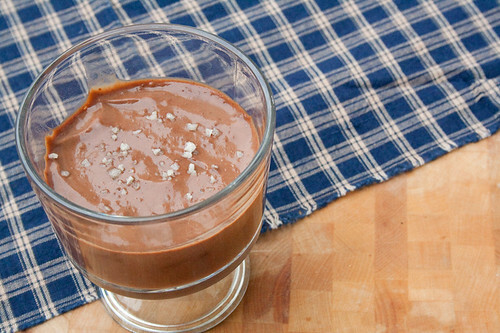 Mousse au chocolate is one of my favorites, but when I make it I can never get the texture just right.